What Is the Average Life Span of a Goldfish with Proper Care? Goldfish can live long lives with proper care. Many people had a goldfish as their first pet. The small, typically orange fish can be found for sale in pet stores or as prizes at carnivals. They don't, however, have a reputation for long lives. Still, with proper care, goldfish can reach old age. The average life span of a pet goldfish is five to 10 years. In the wild, they can live as long as 25 years. In fact, the oldest goldfish ever recorded was 43 years old. But prolonging the life of your fish depends on proper care and tank environment. Goldfish require a lot of upkeep. They must be fed a few times a week. Their tank water must be changed at least two to three times a month. Goldfish like cool water; the water temperature for their tanks should be between 65 to 68 degrees Fahrenheit. However, be careful. Typical goldfish prefer colder water, but fancy goldfish, such as black moors, veil-tails and orandas, do not. As the temperature in the tank increases, goldfish become sensitive to the limited availability of oxygen. Make sure you know the type of goldfish you have before establishing its tank's water temperature. Most first-time goldfish owners, especially parents who give their children goldfish, purchase small round bowls as aquariums. But goldfish need room to grow. Small spaces not only restrict growth, but make the fish more prone to illness. Owners should have a tank of at least 20 gallons for no more than 35 ounces of goldfish. As the number of fish grow in the tank, the dissolved and particulate organic carbon content of the water rises, causing the bacterial load in the water to increase. A crowded fish bowl or aquarium is a mishap waiting to happen. These aquariums should also have air pumps to keep the level of oxygen in the water suitable. Goldfish, like any pet, require proper diets. Look for high-quality flake foods and supplement them with freeze-dried foods and vegetable matter. You can even give your fish the occasional treat such as daphnia—tiny crustaceans that resemble fleas. Never overfeed your goldfish. 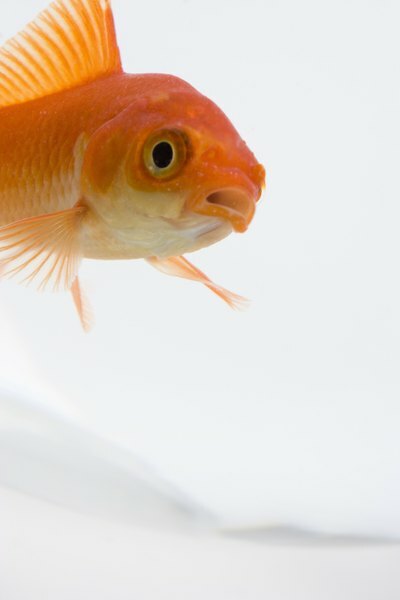 This is the most common mistake among first-time goldfish owners. Too much food can end up in the tank as excess fish waste. Uneaten food can also quickly decompose, causing organic and inorganic compounds that tip the balance of an aquarium's chemistry. Signs of overfeeding include cloudy water, algae growth, patches of fungus and mold, hair-thin worms and low dissolved oxygen levels. Do Goldfish Grow to the Size of Their Environment? How Fast Do Goldfish Fry Grow? What Is Stunting a Goldfish's Growth?